"A rustic and hearty Eastern European classic originating from the Ukraine with beets, potatoes, and lentils. A wholesome soup for vegetarian diets and gentle on the budget, too. Serve with sour cream and fresh dill." Combine beets and vinegar in a small frying pan over low heat. Cook, while stirring, until soft, about 15 minutes. Heat oil in a large frying pan over low heat while beets are cooking. Add onion and stir for 2 minutes. Add carrots and cook, stirring occasionally, until soft, about 10 minutes. Set aside. In the meantime, bring water to a simmer in a large saucepan. Add cabbage and lentils. Cook for 10 minutes. Add potatoes and cook for 10 minutes more. Stir in cooked beets and onion-carrot mixture. Season with salt and pepper. Add tomato paste and simmer until all vegetables are tender, about 10 minutes more. Serve with sour cream and dill. 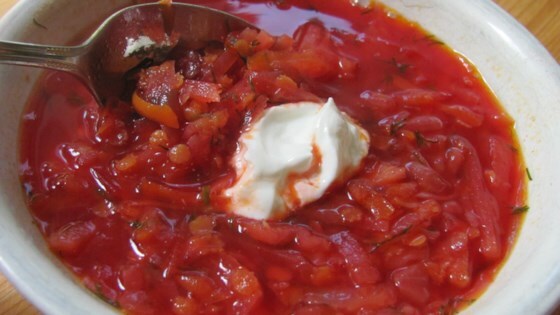 See how to make an authentic beet and sausage soup straight from the Ukraine. I like to boil beets first separately. And start with frying carrot and onion then pour water, always.